"To get the gold, they will have to kill every one of us"
Of the thousands of "Avatar" screenings held during the film’s record global release wave, none tethered the animated allegory to reality like a rainy day matinee in Quito, Ecuador. It was late January 2010 when a non-governmental organization bused Indian chiefs from the Ecuadorean Amazon to a multiplex in the capital. The surprise decampment of the tribal congress triggered a smattering of cheers, but mostly drew stares of apprehension from urban Ecuadoreans who attribute a legendary savagery to their indigenous compatriots, whose violent land disputes in the jungle are as alien as events on "Avatar’s" Pandora. Three years after "Avatar’s" Quito premiere, declarations of martial readiness are multiplying and gaining volume throughout the tribal territories of Ecuador’s mountainous southeast. The warnings bare sharpest teeth in the Shuar country of the Cordillera del Condor, the rain forest mountain range targeted by President Rafael Correa for the introduction of mega-mining. Domingo Ankwash, a Shuar leader and president of the Asociacion Bomboiza, is leading the fight against proposed large scale mines in the Cordillera del Condor. My guide to this simmering "Avatar" in the Amazon was a 57-year-old Shuar chief named Domingo Ankuash. 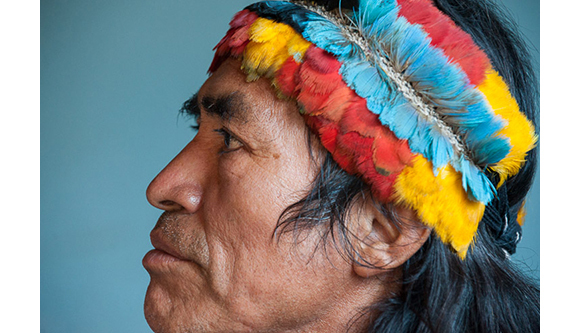 Like many elder Shuar, Ankuash does not appear to be blustering when he says he will die defending his ancestral lands in the province of Morona-Santiago, which borders Peru. Early in my month traveling the Condor, he took me deep into the country for which he is prepared to lay down his life. After a steep two hours’ hike from his village, we arrived at a forest clearing of densely packed earth. Through the trees and hanging vines, a 40-foot waterfall replenished a deep rock-strewn lagoon. 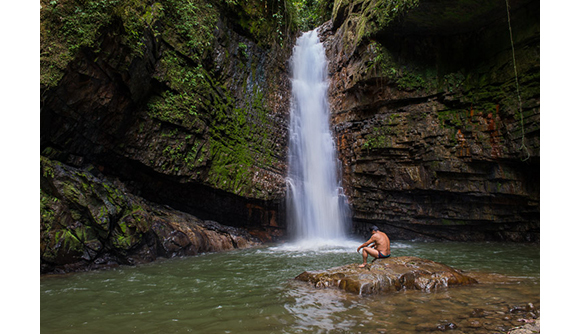 The cascade is one of thousands in the Condor cordillera, a rolling buffer between the cliffs of the eastern Andes and the continental flatness of the Amazon basin. 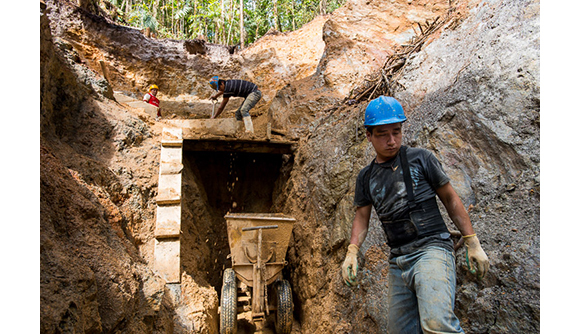 To help him grab these shiny metals, Correa has invited foreign mining firms to deforest and drill much of the country’s remaining pristine forests. Not far from where Ankuash and I are sitting, a Chinese joint venture led by the China Railway Corp. is building infrastructure for an open-sky copper mine with the "Lord of the Rings"-sounding name of Mirador. To the north and east of the Chinese concession, the Canadian gold giant Kinross is prepping its 39 lots, including the envy of the industry, Fruta del Norte, believed to be Latin America’s largest deposit of high-grade gold. These projects are merely the first wave; others wait in the wings. Together they threaten more than the Shuar way of life and the sustainable agricultural and tourist economies of Ecuador’s southern provinces. The Condor is a hot spot of singular ecological wealth and a major source of water for the wider Amazon watershed to the east. What happens there is of global consequence. Shuar leader Patricio Tiwiram sits below a waterfall along the Rio Kupiamias. 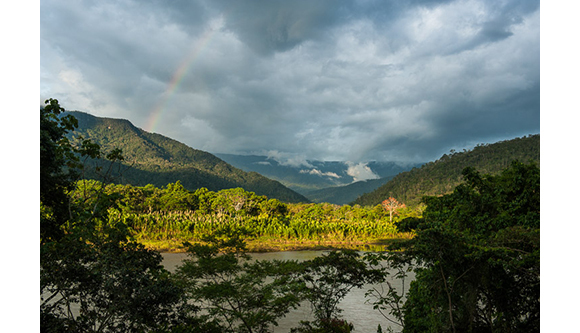 This is a sacred spot for the Shuar and one threatened by nearby mining concessions. Most people have heard of the Shuar, even if they don’t realize it. They are the storied Amazonian “head shrinking” tribe. Each of a long succession of enemies have learned firsthand of their tzantza ritual, in which the heads of slain invaders are removed at the collarbone, relieved of their skulls, and shrunk by seasoned boiling in a multi-day ceremony. Tzantza is just one of many rituals rooted in a cosmology of animist spirits. Collectively, these spirits are known as Arutam, a shape-shifting pantheistic godhead whose name loosely translates as “soul power.” Atop a bridge leading to Shuar territory in the southern province of Zamora-Chinchipe, I encountered an oversize statue of Arutam in human form wielding a staff astride a giant toucan, redolent of the dragon-like beasts of "Avatar." If James Cameron’s fictional Na’vi of "Avatar" reflect the essence and predicament of one real-world tribe, it’s the Shuar. While they do not expect an action-hero savior to fall from the sky, they recognize that avoiding further bloodshed and protecting the Condor ultimately depends on getting the attention of the wider world, and quickly. Rain clouds and a rainbow hang over forested slopes along the Rio Zamora and near the site of the proposed Mirador Mine site. 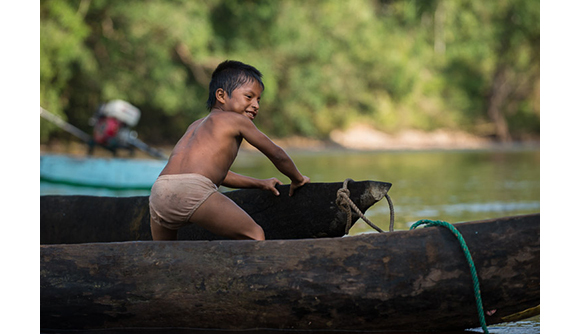 A Shuar boy plays in canoes along the Numbkataime River. Shuar communities depend on rivers and fresh water as sources of food, drink, transportation and spiritual renewal and strength. Men shovel gold-bearing earth into a cart at a medium-scale mining operation near the proposed Fruta del Norte Mine, Cordillera del Condor. 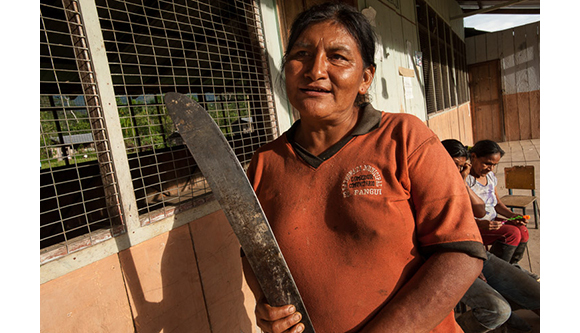 A Shuar woman, Mercedes Samarent, holds a machete, which she says will be the "women's weapon" in the case of conflict over proposed mines, in a community of Arutam along the Rio Zamora. 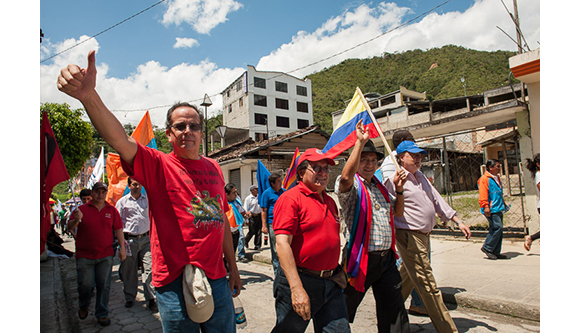 A coalition of leftist candidates, including Alberto Acosta (left) and Salvador Quishpe (third from left), campaign for president and against large-scale mining, in the town of Zamora. 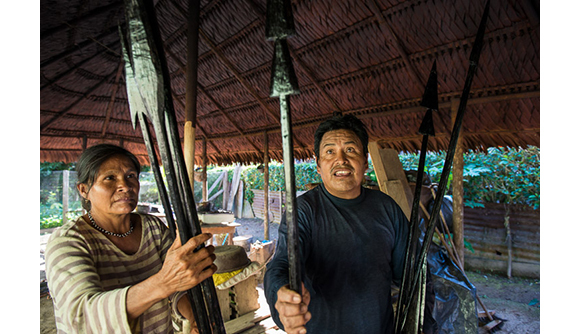 Patricio Tiwiram, the leader of the Shuar community of Kupiamais, and his wife display traditional spears used in raids on Ecuacorriente mining camps. 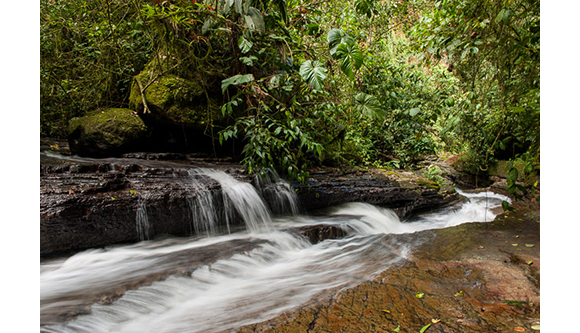 The Rio Kupiamais, a sacred river for the Shuar, flows through rain forest vegetation. The river is threatened by mining concessions near its source. I spent much of my last day in Ecuador drinking coffee at a café with a good view of this Jumbotron. After a month in the south, the slick nature montage appeared to me as the billboards in dystopian science fiction, a sunny, high-tech tourism version of “War Is Peace,” or Latin versions of the electronic messages projected into the dark, rainy worlds of "Blade Runner" and "Children of Men." I was pulled out of this reverie by the appearance on the screen of a giant pixilated toucan. With wings spread wide, the bird reminded me of the Arutam statue above the bridge in Zamora-Chinchipe. As told to me by a Shuar shaman named Julio Tiwiram, the image of Arutam and the toucan comes from a bit of tribal folklore dating to first-contact with the Conquistadors.